The Witchcliffe Ecovillage is a unique residential development that is set to become one of the world's first fully integrated villages to be self sufficient in renewable energy, water, and fresh food produce. The small village of Witchcliffe is located only 10kms south of Margaret River, and just down the road from the magnificent Redgate Beach and many wonderful wineries like Leeuwin & Voyager Estates. The Witchcliffe Ecovillage vision is to create a model of a highly sustainable, self reliant community in a regional village setting, incorporating the best of 21st century technology and human settlement design to enable the Ecovillage community to produce as much energy as it consumes; be self-sufficient in water; care for the local environment; generate ongoing economic and social opportunities for the area; be socially diverse; and be self-sufficient in fresh food produce. It will become a place where people live, work, socialise, and provide for their material needs sustainably; where most of what they consume on a daily basis can be produced within the Ecovillage, in harmony with the permaculture principles of “earth care, people care, and fair share." Opportunities for affordable housing, social diversity, aged care and community building are an integral part of the Ecovillage design. The Witchcliffe Ecovillage is being designed and developed in a manner that will enable the community to be as harmlessly integrated into the local environment as possible. This means that the community’s energy, water and fresh food produce will be produced and harvested on site without pollution, with an emphasis on restoring and protecting indigenous flora and wildlife habitat. In time, it will grow to be a model demonstration site where people can come to learn how to live more sustainably. At the Witchcliffe Ecovillage, our objective has always been to create the most sustainable, fully featured ecovillage possible. We aim to create a model that demonstrates just how sustainable a residential subdivision can be with good planning, strong environmental principles, sensible financial management and technological innovation. We believe that true sustainability is not about being slighty more environmentally friendly than your neighbour: it is about trying to live simply and ethically in a way that best conserves and regenerates resources for future generations to enjoy. To make these lifestyle choices easy for Ecovillage residents, we have built sustainability into every aspect of the project. Our design team has used the triple bottom line model to make every planning and design decision: whether about wastewater, energy, materials, transport, etc., we have asked ourselves, “Does this solution tick all 3 boxes of social, environmental, and economic sustainability?” This has been an involved and time-consuming process, with the right solutions sometimes taking years to come together. Wherever possible we have worked in-house and used local consultants to keep our costs low and provide local employment, because we believe an ecovillage has to be affordable if it’s to be a socially inclusive model for the future. 100% renewable energy; 100% water self-sufficiency; environmentally sensitive waste water treatment; solar passive house design and lot layouts; low carbon, low toxicity and local building materials; waste management systems; bike and pedestrian friendly path networks; local employment and business opportunities; conservation of remnant bush habitat and streams, protection of wildlife and control of domestic animals; NBN fibre to every premise to enable fast efficient communication; and most importantly, a healthy, caring, socially inclusive community that is set up to be largely self sufficient in organic food. The Witchcliffe Ecovillage has been designed with a variety of lot sizes and uses in order to encourage a diverse community, with couples and singles of all ages, established families, retirees, and young people moving into their first homes as renters or first home owners. A range of different lot products will encourage those who want to work from home, artists and artisans who want to create, and those who wish to run a small business or organic farm enterprise. All homes in the Witchcliffe Ecovillage will be required to be 100% energy neutral with solar panels and battery storage; 100% self sufficient in water with rainwater tanks; solar passive; energy and water efficient; made of local and alternative materials to reduce embodied energy; and complementary to the existing rural character of Witchcliffe. NBN “fibre to the premise” will be provided to every home and business. Stage 1 of the Ecovillage will begin in the centre of the development. 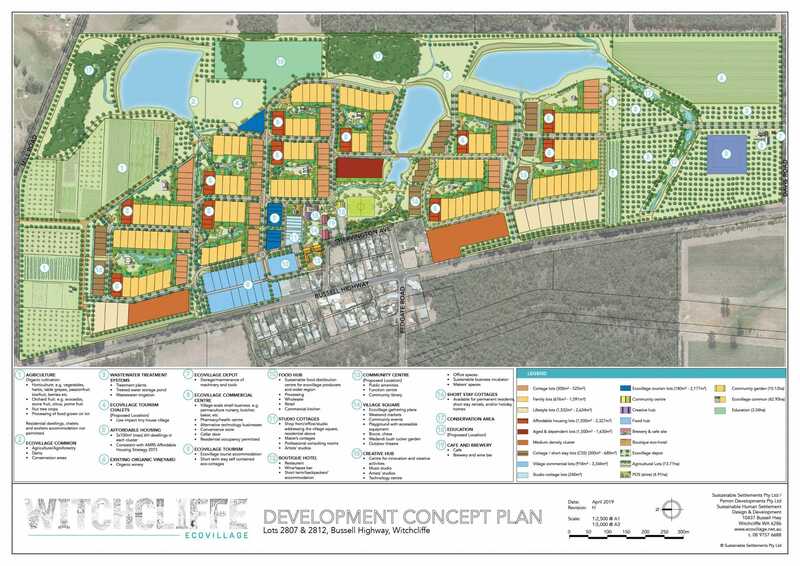 It will include the Village Square and the public oval, 3 central residential community garden clusters with Cottage, Family and Affordable lots, as well as selected Lifestyle lots, Short Stay Cottage lots, and Commercial lots. It is anticipated that construction of Stage 1 will begin in late 2018. For people living in the Ecovillage, but also the wider community and tourists, the Village Square will be an exciting and stimulating cultural oasis that caters for all ages in a flexible and lively but safe environment. On the south side of the Square is the Community Centre with public facilities, child care and a café; to the west is a boutique Eco-hotel consisting of a restaurant, bar, café, function room and accommodation; to the east is a building forming the Creative Hub which is a place for studios, offices, IT-hubs, shared and individual work spaces; and the north is bordered by 8 small Mixed Use Cottage lots where creative makers can live and have their in-house workshops/studios facing the Square interacting with the public. The Village Square itself will be a pedestrian only space, landscaped with shade trees, public art work and street furniture, with plenty of spots to tie up your bike, sit and have a chat, play chess, picnic, or listen to some busking. We envisage regular food and crafts markets, performances, exhibitions and other small-scale events. Accessibility will be a feature of the Village Square design, to ensure that people of all ages and abilities can enjoy the public facilities. Adjacent to the Square is a beautifully landscaped park with flowing pedestrian and cycle paths, more seating, shade structures and bbqs for picnics, an adventure play area for smaller and larger children, a skate park, tennis courts and a petanque area. The rear of the park connects to the oval and the beginning of the longer Ecovillage walk trails. In the Village Square, activities for the whole family can happen simultaneously – kids can play sports on the oval, skateboard, or play in the playground, while parents can visit the markets, go to a yoga class or have coffee. The aim is to eliminate the common stress caused by the need to drive between five different places on a weekend morning. Instead this concept brings people together in a more relaxed and flexible fashion. We envisage the Village Square to be a lively place that is enjoyable to visit, catch up for a coffee, have a meeting, go to a function, see crafty makers in their workshops, do some research in Community Centre library, check out the Creative Hub and more. It will form the public face of Witchcliffe Ecovillage – here we share our resources, ideas and culture and invite in the larger community and visitors from near and far. The heart and soul of the ecovillage… a place for sharing, enjoying, meeting, learning and celebrating together. A connected, collective workspace which will nurture creative enterprises, artistic projects, and sustainable technology and services within the Ecovillage, providing opportunities for collaboration and innovation. The Food Hub is central to our food distribution network, a collective space for organic growers within the Witchcliffe Ecovillage to wholesale, retail, process, and value add their fresh food produce. Fun and funky short stay accomodation and organic wine bar for Ecovillagers, locals and tourists, the perfect place to get a taste of Ecovillage life.